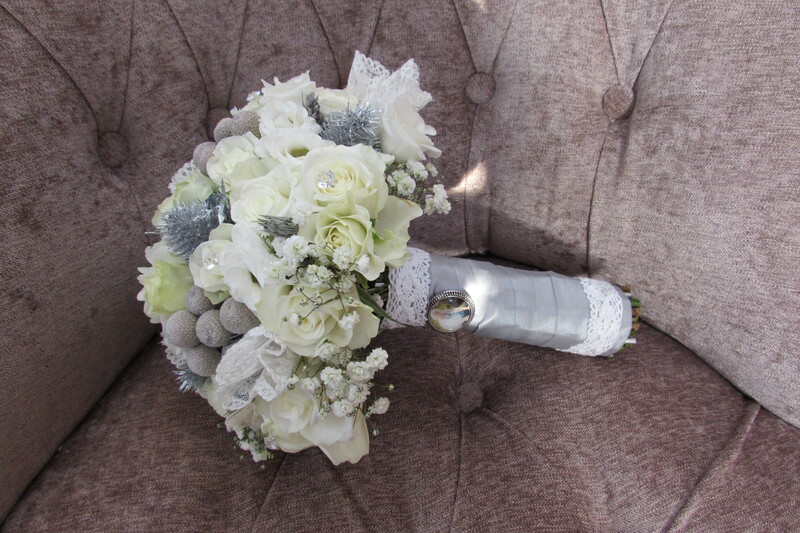 On New Years eve 2016, Tullow Parish church was transformed into a shimmering winter wonderland with decor and flowers in a snowy crisp white and sparkling silver colour scheme for Sarah and Mikey's wedding. Back in early 2015 I received an email from Mikey, a Carlow man living in Perth, Australia with his fiance Sarah, asking me to be their wedding florist on New years eve 2016 in The Parish church, Tullow. Every detail of their dream wedding was discussed in the 20 months leading up to their wedding through email, until we met just 2 weeks before their big day when they both came back from Australia. Sarah had emailed me a picture of an artificial bouquet, which she had found on the internet and wanted a similar one in real flowers. A girl that knows what she wants, makes my job easier. I delivered the bridal flowers to the family home in Tullow, where everyone became very emotional with tears of joy seeing the bouquets and seeing a memory broach of Sarah's Granny attached to her bouquet! The Bridal party looked stunning and the Parish church of Tullow, Co Carlow looked magnificent with Sarah's winters wonderland colour scheme of whites and silver! I'm sure this New Years Eve party and family celebration went on until the next day!